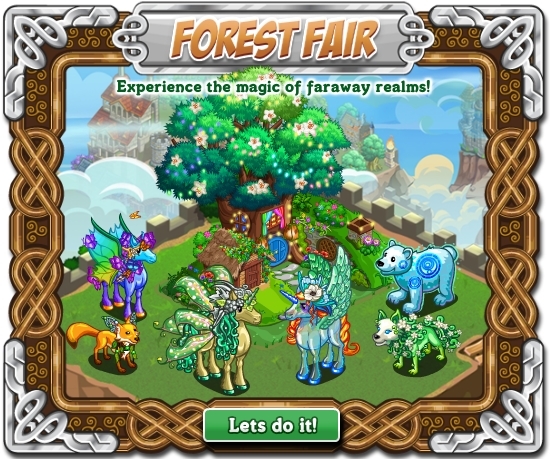 – Home Pen is the storage section of the Forest Fair where you can store your crafted items. – Play Area is the storage section of the Forest Fair where you can store the primary materials that are used for crafting. Harvest for Glass Flower every 2 min. Harvest for Starlight Orb every 2 min. Harvest for Rainbow Fleece every 3 min. Harvest for Golden Strings every 3 min. Harvest for Fool’s Gold every 4 min. Harvest for Foraging Herbs every 5 min. Harvest for Rune Stones every 5 min. Sheaf of Stars = Starlight Orb x1, Glowing Phlox x1 and Bottled Starlight x1. 1. Daisy Hedgehog = Starlight Orb x2, Snowdrop x2 and Astral Lantern x1. 2. Winged Boar = Glass Flower x1, Edelweiss x1, Bottled Starlight x1, Rainbow Fleece x1, Astral Lantern x2 and Rainbow Silk x1. 3. Friar Badger = Golden Strings x2, Sheaf of Stars x1, Golden Daisy x1, Rainbow Fleece x1, Faery Crown x1 and Dryad Masque x1. 4. Glade Fox = Starlight Orb x1, Sheaf of Stars x1, Glass Flower x1, Astral Lantern x1, Rainbow Silk x1, Rainbow Fleece x1, Golden Strings x1, Edelweiss x1 and Minstrel’s Hat x1. 5. Wood Imp = Astral Lantern x1, Edelweiss x1, Sheaf of Stars x1, Starlight Orb x1, Golden Daisy Chain x1, Faery Crown x1, Bluebell Scarf x1, Dryad Masque x1 and Bard’s Staff x1. 6. Gaelic Badger = Glass Flower x2, Music Blower x1, Bottled Starlight x1, Golden Harp x1, Bluebell Scarf x2 and Aqua Regia x1. 7. Phoenix Pheasant = Golden Strings x1, Shining Flute x1, Sheaf of Stars x1, Foraging Herbs x1, Bluebell Scarf x1, Bard’s Staff x1, Snowdrop x1, Pan’s Helm x1 and Minstrel’s Hat x1. 8. Sylvan Wolf = Dryad Masque x1, Brew of Love x1, Sheaf of Stars x1, Minstrel’s Hat x1, Shining Flute x1, Golden Harp x1, Bottled Starlight x1, Rainbow Silk x1 and Music Blower x1. 9. Rune Bear = Foraging Herbs x1, Edelweiss x1, Rainbow Silk x1, Fool’s Gold x1, Music Blower x1, Jar of Dreams x1, Golden Shield x1, Snowdrop Stars x1 and Bottled Joy x1. 10. Dale Horse = Golden Strings x3, Sheaf of Stars x2, Elixir of Life x1, Faery Crown x1, Pan’s Helm x1, Snowdrop Stars x1, Bluebell Scarf x1, Dryad Masque x1 and Healing Salve x1. 11. Pan Horse = Glass Flower x3, Sheaf of Stars x3, Golden Daisy Chain x2, Starlight Orb x3, Golden Daisy x3, Minstrel’s Hat x1, Golden Strings x1, Shining Flute x1 and Magic Blossom x1. 12. Foxglove Unicorn = Edelweiss x2, Golden Lute x2, Philosopher’s Stone x1, Rune Stones x3, Celtic Lute x2, Gold Coins x1, Bottled Starlight x2, Golden Shield x1 and Northern Lights x1. 13. Druid Pegasus = Rainbow Silk x6, Dryad Masque x6, Arcane Spell x2, Pan’s Helm x1, Aqua Regia x1, Shining Flute x1, Bottled Joy x1, Golden Harp x1 and Cask of Riches x1. 14. Dryad Pegacorn = Rainbow Fleece x6, Edelweiss x5, Philosopher’s Stone x2, Sheaf of Stars x2, Brew of Love x1, Golden Shield x3, Golden Lute x1, Jar of Dreams x1 and Northern Lights x1. 15. Herne Stag = Sheaf of Stars x4, Dryad Masque x4, Bard’s Staff x3, Pan’s Helm x2, Minstrel’s Hat x3, Shining Flute x3, Faery Crown x3, Golden Daisy Chain x3 and Magic Blossom x1.